The system intervenes only when driving economically. Depending on the driving situation and your vehicle's equipment, the system may advise you to skip one or more gears. You can follow this instruction without engaging the intermediate gears. The gear engagement recommendations must not be considered compulsory. In fact, the configuration of the road, the amount of traffic and safety remain determining factors when choosing the best gear. Therefore, the driver remains responsible for deciding whether or not to follow the advice given by the system. - You are in third gear. - You press the accelerator pedal moderately. - The system may suggest that you engage a higher gear, if appropriate. 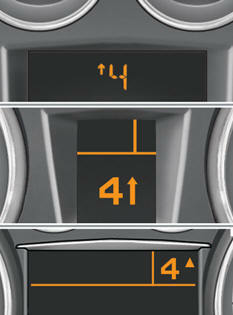 The information appears in the instrument panel in the form of an arrow accompanied by the suggested gear. In the case of driving which makes particular demands on the performance of the engine (firm pressure on the accelerator pedal, for example, when overtaking...), the system will not recommend a gear change.